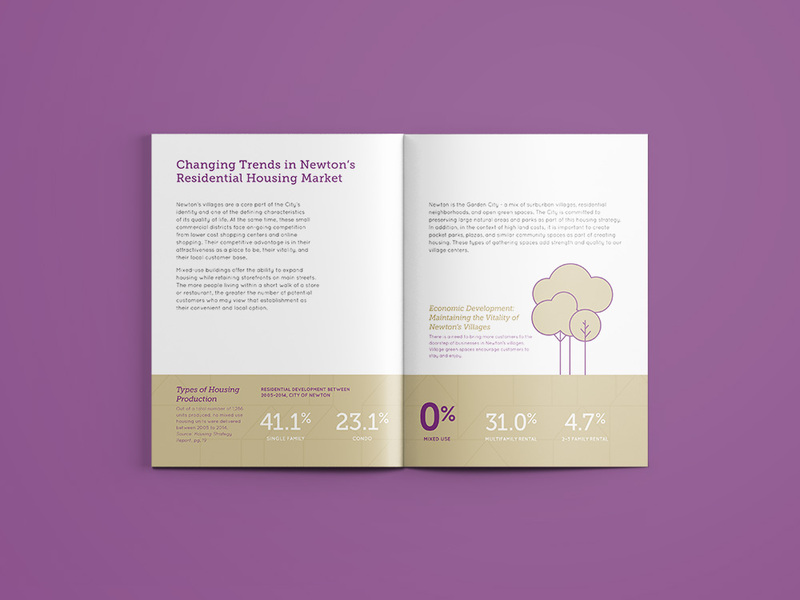 Research conducted by Sasaki and RKG Associates was leveraged to create a factbook promoting the city of Newton’s housing initiative, Newton Leads 2040 Housing Strategy. Working closely with Newton’s Department of Planning and Development and the Mayor’s Office the book was designed to share this important information in an accessible and visually engaging manner. Using the research and data, a storyboard was developed, pacing important facts and statistics and tempering them with text or illustrations. A bold, upbeat, and accessible visual language was developed to tell the story of the future of housing in Newton; an abstracted house suggests the idea of enhancing the community through diverse housing solutions. The design for the brand mark is intentionally flexible so that it can easily translate into a pattern, as well as smaller visual elements, and reoccur throughout the document. anyone could pick it up and understand it, not just housing experts or city officials.